자연암벽에 신체를 선으로 새기고 머리는 따로 올려놓은 전체 높이 12.38m의 거구의 불상이다. 이러한 형식의 불상은 고려시대에 많이 만들어졌는데, 파주 용미리 마애이불입상(보물 제93호)도 이와 거의 같은 수법을 보여준다. 머리의 뒷부분은 거의 파손되었으나 앞부분은 온전하게 남아 있다. 머리에는 상투 모양의 머리(육계)가 높이 솟아 있고, 얼굴에는 자비로운 미소가 흐르고 있어 거구의 불상임에도 전체적인 형태는 자연스럽다. 머리와 얼굴 특히 입에는 주홍색이 남아 있어서 원래는 채색되었음이 분명하다. 옷은 양 어깨를 감싸고 있으며 몇 개 안되는 옷주름은 매우 도식적(圖式的)으로 표현되고 있다. 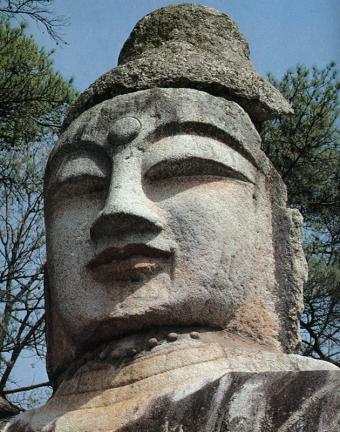 양 손은 검지와 가운데 손가락을 맞대어 왼손을 가슴에 대고, 오른손을 배에 대고 있는 모습이다. 이 작품은 고려시대에 유행하던 지방화된 거구의 불상 가운데 하나로 당시 불상 양식을 살피는데 중요한 자료가 되고 있다. 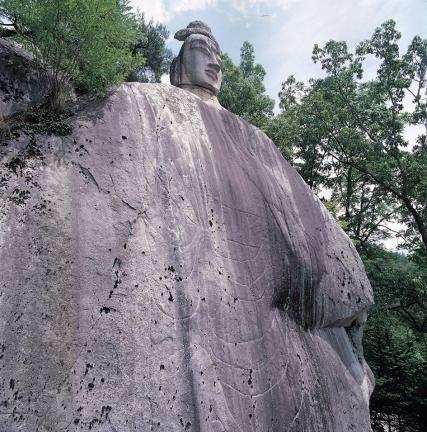 The body of this huge Buddha statue was carved in a line on a 12.38-meter-high natural rock face. 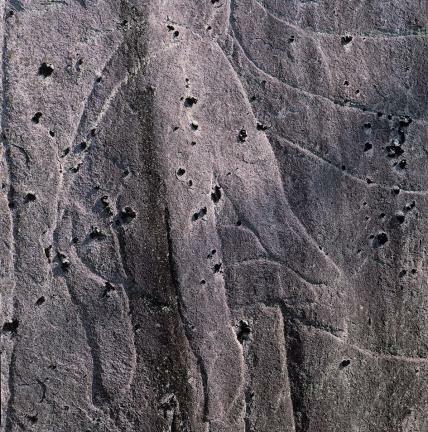 The head was separately placed on top. 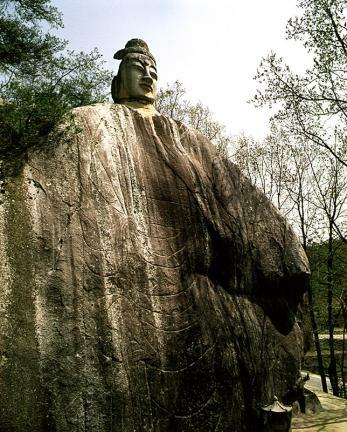 This method was generally used in the Goryeo Dynasty. 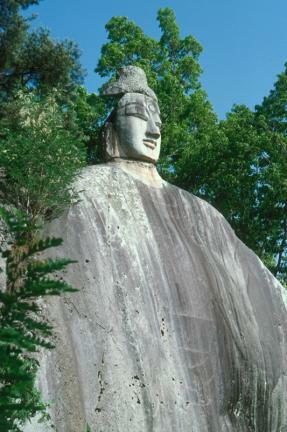 The Two Rock-carved Standing Buddhas in Yongmi-ri, Paju (Treasure No. 93) are another example. The back of the head was almost completely destroyed, but the front is intact. 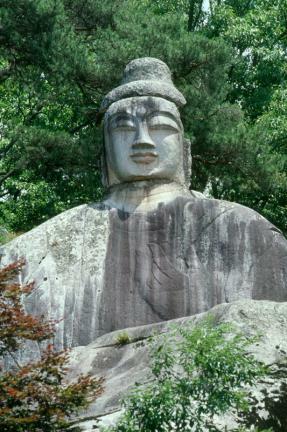 The usnisa (a protuberance symbolizing supreme wisdom), shaped like a topknot, is relatively high, and the long eyes and thick lips are smiling serenely. Despite its huge body, the statue is well-balanced overall. There is a little bit of orange paint left on the head, face, and lips in particular, telling us that this statue used to be painted. The folds in the clothes covering both shoulders look like a graph. The index fingers and middle fingers of each hand are put together, with the left hand on the chest and the right hand on the stomach. 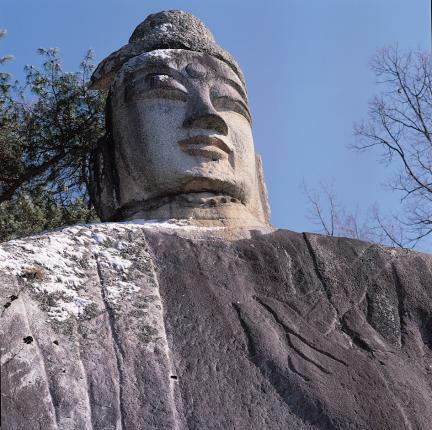 This huge Buddha statue represents the dominant style of folk Buddha statues made during the Goryeo Dynasty and serves as important data in studying the Buddha statue of the time.